CHARITY ROBEY PHOTO The week after Labor Day, and the only lack of parking spaces on Shelter Island is at the school bike rack. When I ask people to name the best day of the year on Shelter Island, most of them don’t miss a beat. It’s the Tuesday after Labor Day. Mary Hillemeier amid binfuls of the fruit of her team’s labors at the Manor’s farmstand. Farming is not what it used to be. Mary Hillemeier, vegetable grower at Sylvester Manor Farm, is articulate, well-educated and elegant. The very model of a modern farmer, she is trained in, and devoted to small-scale, sustainable and community-based practices. CHARITY ROBEY PHOTO | Tomatoes from Wickham’s, basil from Sylvester Manor and mozzarella from Goodale Farms are the basis of this simple salad. Every year around this time, I think a lot about when the tomatoes are coming. The weeks prior to their arrival at the Farmers’ Market are anxious ones for me. Just as my hound obsessively checks every inch of the floor under our dining room table, so do I sniff around the offerings at the stores and markets. Are they from a greenhouse? Worse yet, did they arrive by truck, from far away? This year has been crueler than usual, with a cold wet spring delaying the field tomatoes. Wickham’s (Main Road in Cutchogue), and K.K.’s (Main Road in Southold and on Saturdays at the Shelter Island Farmers Market) now have heirloom and cherry tomatoes thanks to their greenhouses and raised beds that allow the tomatoes to develop in spite of the anti-tomato-weather. I was relieved when the first yellow vine-ripened tomatoes from Wickham’s appeared. They are still not quite the deep red juicy beauties of late summer, but good enough to begin preparing my go-to summer salad. We eat this salad at least twice a week during the high season of tomatoes because it is dead easy, a crowd-pleaser, and it’s probably good for you. That last part depends on how heavy a hand you have with the mozzarella. 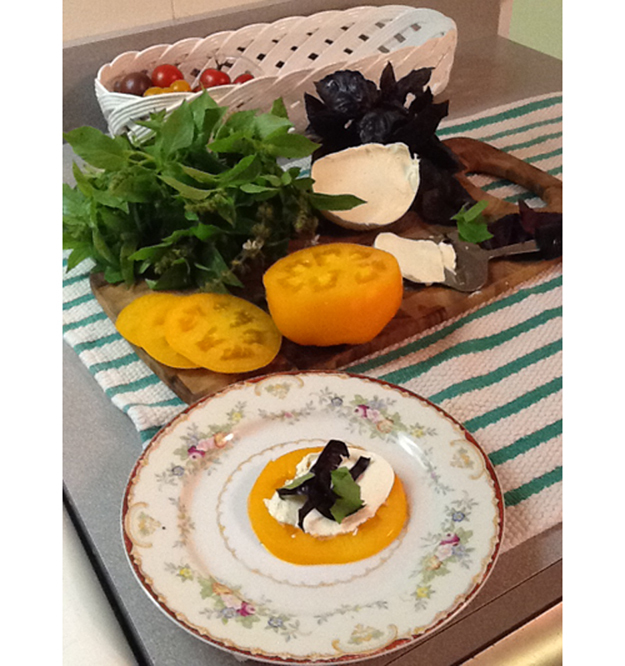 The basil and mozzarella are also important to this salad, and the Sylvester Manor Farm (Saturdays at the Shelter Island Farmers’ Market, and daily at 21 Manwaring Road) has some very beautiful and unusual basil. They raise two purple varieties, that Ben Hill, the Sylvester Manor markets coordinator says are called “Purple Opal”, and “Purple Amethyst.” They also have a lemony basil called “Mrs Burns,” named for the woman who grew this heirloom variety for decades in New Mexico. The mozzarella that Goodale Farms (Main Road in Riverhead and Saturdays at the Shelter Island Farmers Market) has been making is fantastic, and perfect for this dish because it is firm enough to slice thin. This is what’s called a composed salad. It’s called composed because you don’t toss it; just let the ingredients get to know each other for a few minutes before serving. Also, because once I make it, I regain my composure, relieved of any anxiety about the arrival of tomato season. Do not attempt this with a supermarket tomato. 4 tomatoes, remove stem and slice crosswise (not end to end). If you don’t have a really sharp knife, use a serrated-edge or bread knife. 8 ounces mozzarella, sliced into thin circles, one placed on each tomato slice. 10 basil leaves torn or sliced into strips and scattered over the mozzarella. 1/2 red onion, diced and scattered over the basil strips. Drizzle 3 tablespoons olive oil evenly over the salad. Drizzle 1 tablespoon balsamic vinegar over all.